"We will enforce the rules rigidly, we make no apologies about that." Operation Enable Louth was formally launched at Dundalk Gaol on Tuesday morning, with senior Gardai warning motorists that the rules in regard to disabled parking bays will be enforced rigidly throughout the county. Operation Enable is a multi-agency initiative between An Garda Siochana, Louth County Council, the Disabled Drivers Association of Ireland and the Irish Wheelchair Association. It first launched in Dublin in March 2017 and continues to be rolled out throughout Ireland. Operation Enable aims to remind motorists to respect the wheelchair accessible parking bays in County Louth and prompt disabled parking permit holders to respect the conditions attached to the parking permit. Speaking at Tuesday's launch, Dundalk Gardai Superintendent Gerry Curley and Chief Superintendent for Louth Christy Mangan both stated there would be zero-tolerance approach from Gardai as they tackle those who use the disabled parking spots without a permit or abuse the spots by using without the permit holder in the vehicle. "We won't be using discretion here," Mangan said. "We will enforce the rules rigidly, we make no apologies about that." So far this year, 3,149 fixed charge penalties have been issued to drivers or owners of vehicles found parked in disabled pays without the proper permit or in cases where the permit was being used by someone other than the permit holder. A further 148 fixed charge notices have been issued to drivers stopped in disabled parking bays. Last month, the fixed charge fine for parking in a disabled parking bay without displaying a valid permit increased from €80 to €150. If the fee is not paid within 28 days, it increases to €225. If the fine remains unpaid 56 days after the offence is committed, a court summons is issued. "There's no point in launching something and forgetting about it," Dundalk Superintendent Gerry Curley said. "There is a responsibility on us all now to go out and ensure this is a success. We would like to reaffirm our committment within An Garda Siochana to ensure that." "Councillor Maeve Yore has raised this issue on several occasions over the last number of years," Superintendent Curley said. "It's very very important to raise awareness of the whole area of providing proper parking spaces and access for disabled personnel - to ensure they are kept clear and they are used by the people who are meant to use them." "John Morgan contacted me last year when I arrived to tell me first hand in regards difficulties he faced in Drogheda, Dundalk and a lot of areas in Louth. We sat down and had a frank exchange in regards the difficulties that do exist," Chief Superintendent Mangan told the assembled crowd at the launch. "This operation is about reminding people about the need to respect disabled parking bays and it is about common courtesy and manners. That also includes An Garda Siochana." "I'm a great believer in discretion, in regards giving people a chance on the roads. But we won't be using much discretion in this campaign. People have had long enough to know." "We are trying to educate people. We all need a certain amount of reminding what our obligations are." "We will be regularly enforcing it," Mangan added. "Supt Curley is the District Officer for Dundalk. He will be enforcing it in this area and I will be asking the question every Tuesday (during the Gardai's weekly management meeting); what did we do in terms of Operation Enable?" John Morgan, a wheelchair user since 2012, has been one of the driving forces behind the move to clamp down on disability parking bay abusers. Speaking at the launch, Morgan said the onus should not simply be on Gardai or disability advocates to help change the situation. "13.5% of the population are registered with a disability - so it's up to retailers to get on board as well," he said. "Because we have money to spend as much as anyone else. One in eight people, we can't get access to the shop - we're not going to go into it." "We as permit holders should be responsible as well. We shouldn't let our family members take a loan of the badge. The badge is issued for out benefit." Morgan also felt that disabled parking bays in Dundalk town could be positioned better in council planning. "In the confines of the council building, there's six bays and two at the swimming pool. They've only recently been refurbished - but not one on the town are." "At the moment, from Conlon's on Church Street to the TSB (on Clanbrassil Street), there's only one bay. The international best practice is one in ten." He thanked Cllr Maeve Yore, a well known disability campaigner locally, for her efforts in bringing Operation Enable to Louth. 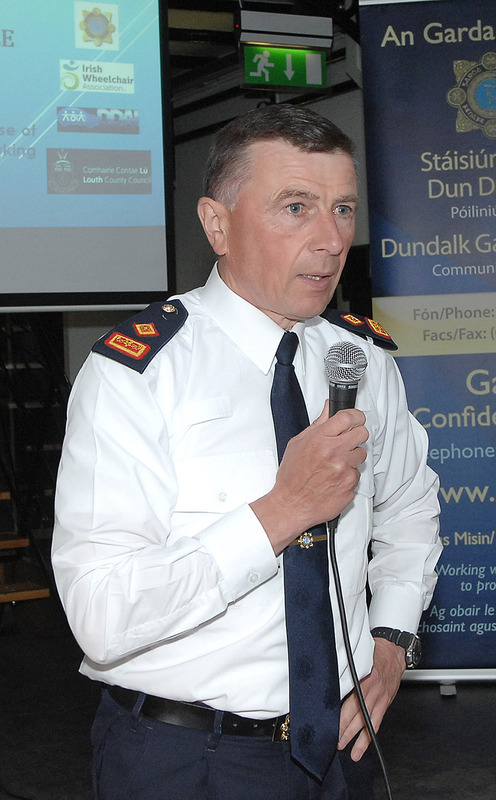 In response to a question from the floor, Supt Curley (above) said that although Gardai could not enforce fixed charge notices in private car parks such as at DkIT and Dundalk Retail Park, he said the Gardai would liaise with businesses to encourage they act by monitoring and clamping abusers of the bays.